Bernard (David Johnson), Robert (Louis Lavoie), and Gabriella (Nina Marti). Photo courtesy of The Highwood Theatre. In the swinging 60’s, the phrase “too much of a good thing” was not often heard. This is the setting for the comic and highly enjoyable “Boeing, Boeing,” now playing at The Highwood Theater. Written by Marc Camoletti and translated from its native French by Beverly Cross, “Boeing, Boeing” received the record for most performed French play by the Guinness Book of World Records in 1991. Bernard (David Johnson) is a successful bachelor who seems to have it all: a beautiful flat in Paris, a sassy maid/housekeeper, Berthe (Sheila Blanc), a lucrative career as an architect, and… THREE fiances! He utilizes a meticulous schedule to balance these three lucky ladies, all of whom are flight attendants, ensuring that they will never meet. There is the quirky New Yorker, Gloria (Ashley Zielinski), the passionate German, Gretchen (Moriah Whiteman), and the fiery Italian, Gabriella (Nina Marti). However, a kink develops in his plan after Boeing unveils its new aircraft, which cuts down on flight time, throwing off his best laid plans. His school friend Robert (Louis Lavoie) turns up for a visit on the very day that Bernard’s plan falls to pieces, and wackiness ensues. Johnson does a great job making a character that could come off as unlikeable into a lovable cad. His descent from smooth ladies man into a bundle of nerves takes the audience on a hilarious ride. Blanc is effective as Berthe, Bernard’s long suffering maid, hitting the right notes as she assists her employer in his balancing act. All three of the fiances bring their own unique personalities (and accents) to the table. Zielinski infuses Gloria with a sort of ding-bat charm, while Marti shines as the no-nonsense Gabriella. Whiteman shows a mastery of both physical comedy and a tricky German accent as Gretchen. But the real standout is Louis Lavoie as Robert, who displays impeccable comedic timing and the charming neurosis reminiscent of a young Peter Scolari. He too takes a highly comedic journey from small-town Wisconsin boy to confident man about town, while learning from his friend Bernard’s mistakes. The set, designed by Kevin Kearney, very effectively utilizes the space and looks quite authentic as a Parisian flat. It also very deftly provides the many close calls as Bernard’s world begins to crumble. The costumes (designed by Tip Letsche) help to transport you back to the 1960s, especially the women’s distinctive flight attendant uniforms. Overall, this is a delightful and hilarious production deftly directed by Sarah Scott. Advisory: There are some adult situations, so this show is recommended for audiences 16 and over. Also, please be advised: there are stairs to get to the theater and no elevator. 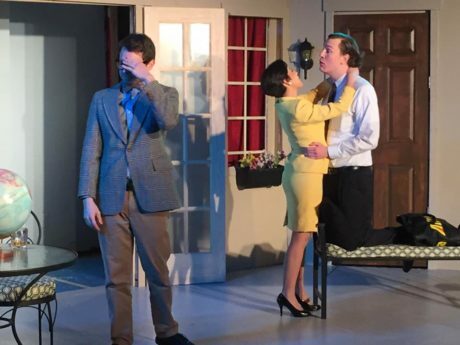 “Boeing, Boeing” is running now at The Highwood Theater in Silver Spring, MD. There are performances on Friday, February 3rd and Saturday, February 4th at 8 pm and Sunday, February 5th at 2 pm. For tickets, click here.